Wow, we just realized it has been over a week and a half since our last blog and we attribute it all to having too much fun! Baja was an adventure of a lifetime and it just keeps getting better. We spent three days in La Paz, really soakin´up the sun, living the relaxing life. We didn´t do too much in La Paz besides shredding the Malecon (beachside boardwalk), eating squid tacos, and drinkin cervesas. Our Thanksgiving was a little atypical for the standard American holiday but we enjoyed it nonetheless. We made an exquistely large egg stir fry breakfast and topped off with some hot, plantain flapjacks for dessert. We all got to skype with our families which was the best part of our Thanksgiving! It is wild that we can be over 2000 miles away from home but still be able to see our families smiling faces and celebrate together! After eating our Thanksgiving breakfast, we quickly packed our bags, jumped on our bikes to take our ferry from La Paz to Mazatlan. Just as we were leaving our hostel, we met some other bike tourists that just got off the ferry and are doing Mexico the opposite direction as us. That was pretty awesome because they were able to spray us down with a ton of beta on Mainland and we were able to give them a ton of info on Baja! Our ferry ride was quite the experience! This ferry is the size of a small cruiseliner and definately the biggest boat that any of us have ever been on! Right as we got to the dock, Ike realized he threw away his ticket! 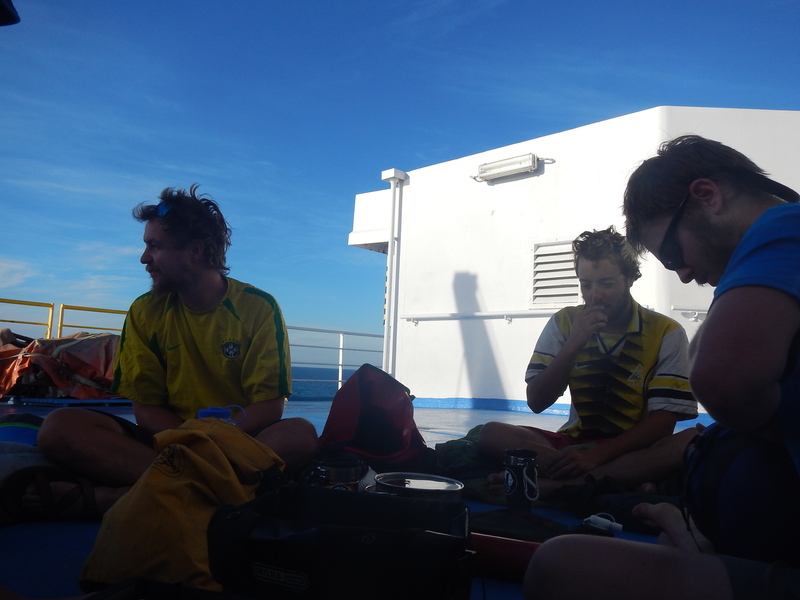 With less than 30 minutes before the boat leaves, he convinced the customer service to give him a free new ticket and we were on our way again…As the clock was ticking, we literally rode our bikes onto the ferry, the only way we could see doing it. The back hatch closed and we were off, starting a whole new adventure, that is Mainland Mexico. 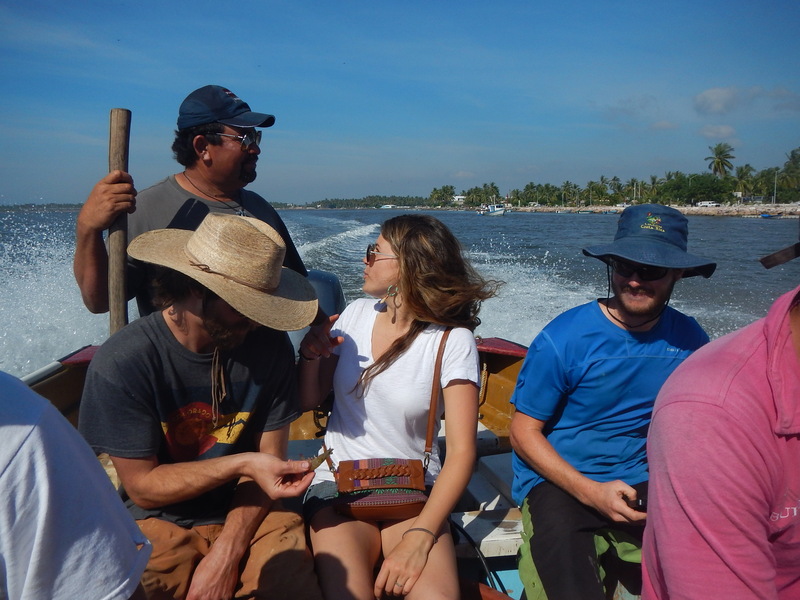 Once on the boat, we ran into the Swiss couple (Samuel and Fluerina) who we had met in El Coyote. It is kind of crazy how many people we have met once and ended up running into again. 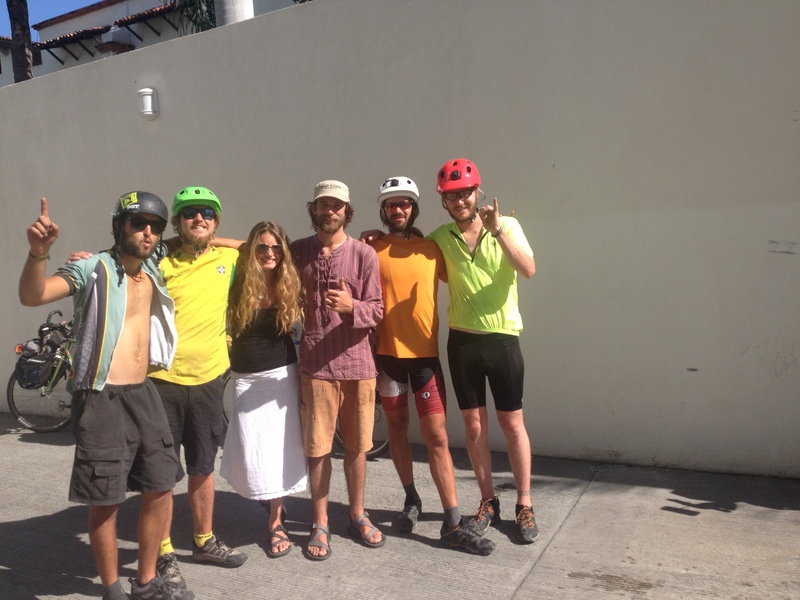 They introduced us to our new buddy Wes, a Canadian who is biking from San Diego to Puerto Vallarta. He has a sailboat down there where he spends his winter. After eating the poor excuse of a dinner the ferry provided us, we decided to hit the deck and do what we do best, dirt bag it. You aren´t supposed to bring food onto boat but we did. We cooked some rice and beans on our stove up on the deck and we are definately not supposed to have open flames on the boat either. After a satisfying second dinner, we pulled out our sleeping bags, and slept for the next 10 hours of our boat ride, getting rocked to sleep by the ocean waves. Getting off the boat in the morning was a lot easier than expected. The port was right next to the old town center, so as we pulled off, we quickly found the malecon and went for an afternoon cruise. Enjoying the beachside cruise and the joy of kind of being in a new country but not really, we decided to hit the beach for a little swim. We needed a place to camp for the night, and a free place since we just spent three nights in a hostel. After asking the locals, it was decided that in front of the resorts in Mazatlan was the place. All the locals said it was cool, and besides the fact that we were outside these big resorts, it was pretty cool camping on the beach. 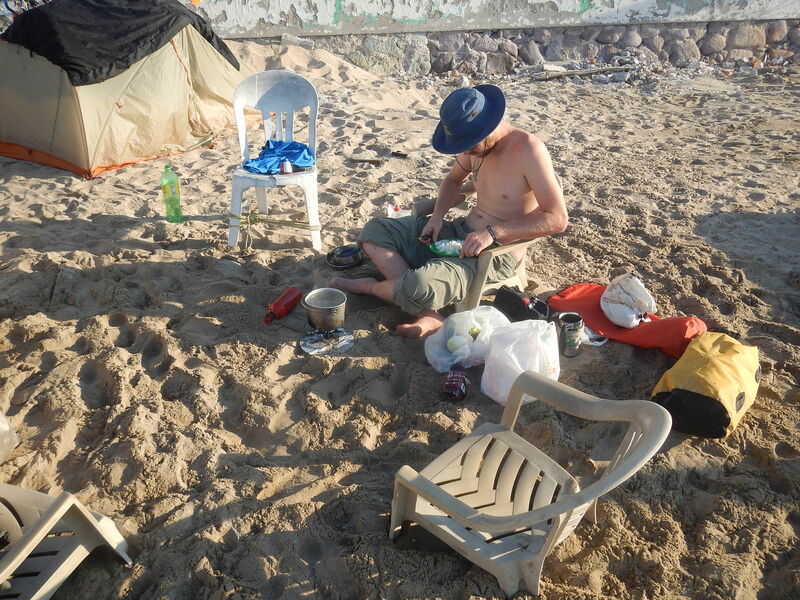 All was good until around 2 or 3 am a police officer tried to say we were not allowed to camp there and wanted to extort $51 USD from us for being there, After arguing for a while, he realized he wasn´t dealing with the average gringos and left us alone. Not digging the big city scene that Mazatlan had to offer, we had to make a plan to leave. Wes and Michele would be in Mexico the next day and we needed to find a good place to meet them. We decided to meet them in Teacapan, a small fishing village 150 km south of Mazatlan. With the time crunch, we unfortunately decided to take a bus to fast track and make sure we could meet them in time. It was an odd feeling being in a bus travelling. We were travelling so fast and not getting to experience the smell, sound, sight, and feel of the road that bike touring provides. The bus dropped us off in a town called Esquinapa, which we were immediately intrigued by. Everyone was riding bikes. Every store had bike racks, it was awesome. This is the first time that we have seen a town dominated by bicycles and it was great! With the sun setting we bee-lined it to a beach 30 km down the rode to spend the night, and be in Teacapan in the morning. Teacapan was suited it the farm land of the pacific coast Mexico. It felt very empowering to see people work the land, living simply to provide for their families and community. Getting into Teacapan was very inviting, especially with the Bienvenidos a Teacapan scene at the head of town. It was a very small fishing community, but very humble. We waited for Wes and Michele in the square for a bit and finally saw their smiling faces! They just travelled 2.5 days by car to see us and have a trip of their own, and it is so awesome that we could travel in another country with them. While we waited for them, we established a free place to stay for a couple nights. An ex-pat named Kurt let us stay in the front yard of his beachside home, so it was pretty cool that Wes and Michele got to see how we go about finding our homes from the day to day. Upon arriving to our luxorious campsite, Wes and Michele showed us all the wonderful gifts they brought us. Snickers, Cheez-its, homemade saurkraut, Colorado beer, and Thanksgiving leftovers! So awesome, couldn´t say thanks enough! Although these things aren´t necessary, it´s having a little taste of home while abroad that keeps us feeling great! Our day and a half in Teacapan was awesome! We swam, played beach futbol, fished, biked around town, and had a lovely fish barbeque with our hosts and friends! The day after we were going to head for San Blas, a well known surfing town and also well known for its bug problem. We got to take a fishing boat across an estuary which dropped us off in a farm town. From there we biked about 40 km to meet up with Wes and Michele who would drive us to San Blas from there, about 75 km away. The boat ride was great! The bike ride from river to meet up point was muy tranquillo (very chill), enjoying the afternoon cruise. Upon meeting up, we packed the back of Wes truck with our bikes and gear, with Ike and Bradie in the cab and Tommy and Hen in the back, riding the highway local style! The road trip experience was pretty great, and seeing the Mexico highway from the back of a pickup was quite the experience! The next two days were spent in San Blas chillin on the beach, drinkin´cervesa, and surfing! For most of the crew it was their first time surfing. We stayed at a hostel called the Stoner Surf Camp, named after the legend Rob Stoner, and rented surf boards too! Not knowing what we were doing, but had an idea since we all snowboard, we quickly started shredding these beginner waves! Everyone got up, and everyone got to shred, even Ike The Skier! San Blas was excellent, but as they say, every silver lining has a touch of grey. San Blas is known for being terrible for the No See Um bugs. Every morning and every evening, we got swarmed by bugs beyond belief! We´re talking 500+ bites per person in the matter of 2 days. It was unreal, by far the worst bug problem any of us have ever experienced. After shredding and living the beach life, Wes and Michele took us out to a nice dinner at the Wala Wala. This was by far the best meal we have all had the whole trip. Between our fish, chicken, and pasta entrees, everyone left feeling full and completely satisfied with our meals!! And for dessert, we went to the San Blas Social Club for some cocktails, which is where we spent the rest of our night! The next day, it was time to move on. 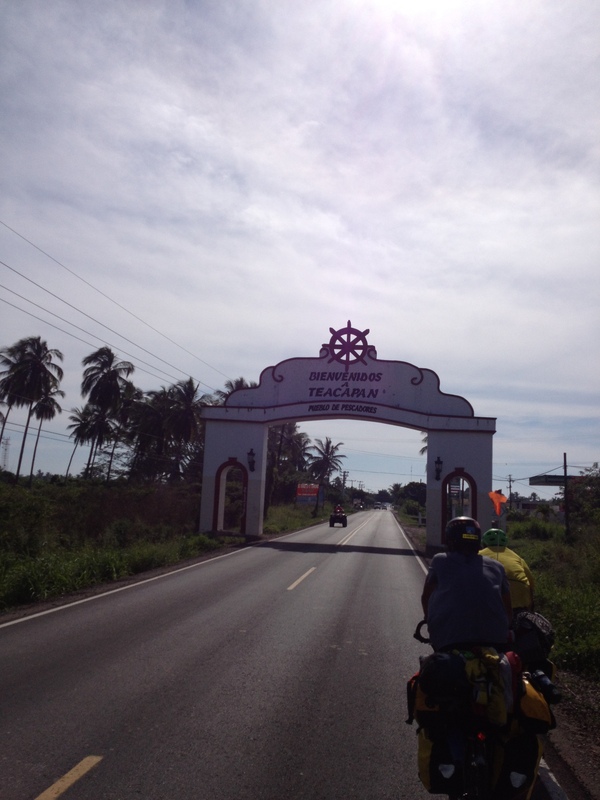 San Blas was great but we are nomads and need to keep moving. 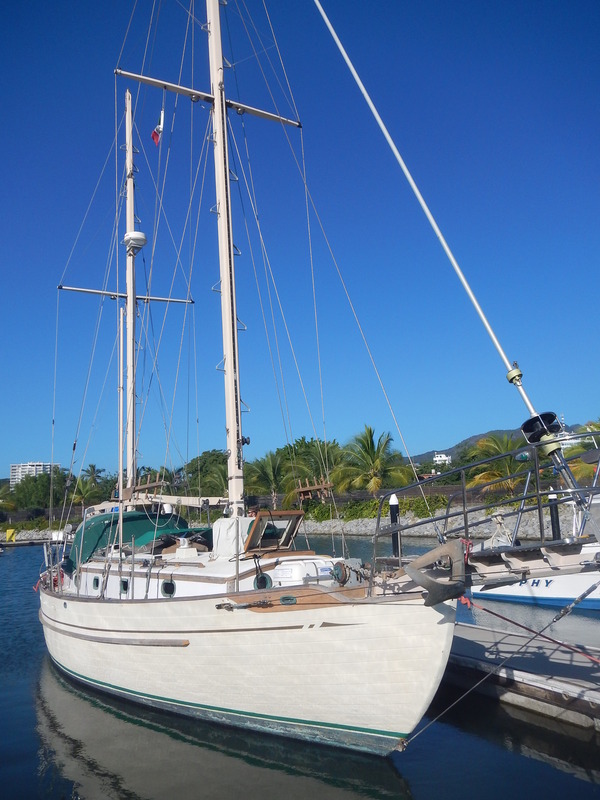 The next destination is La Cruz, which is on the same bay as Puerto Vallarta and the home of our new buddy Wes´sailboat. The gang road for about 50 km unloaded through some of the most amazing countryside some of us have ever seen. We are finally starting to enter the jungle. Tommy was extremely entralled, being the tree lover that he is and this was his first time in the jungle. Jack fruit, bananas, and plantains lined the countryside and using our foraging skills we stocked up! We were pleased to find some banana tree flowers, which Bradie harvested to make soup with, a delicious soup he had when travelling Cambodia last year. After riding for half a day, our support vehicle picked us up and drove us to La Cruz. Using the directions bike tour Wes gave us, we searched for his boat and found him. Stoked for us to show up, he moved some sails around to accomodate 6 weary travellers to sleep on his boat. Its amazing that a 36 foot sailboat can support 7 people but it did! The soup was delicious, the company was spectacular, and the stars were beautiful! What more could you ask for! Well just 20 km from Puerto Vallarta, we rode unloaded into town, cruising thru traffic with our wide shoulder on the 2 lane highway. Biker Wes decided to go on a day ride with us, which was great so we could chill with him longer, and he had the local knowledge of PV. We met up with Wes and Michele at The Hilton Puerto Vallarta, where Wes´dad booked us a room for the night! Thanks a ton! Super upscale for our taste but diggin´it. After cruising the malecon with biker Wes, we said our good-byes and chilled at the hotel. Tonight we´re going dancing then back on bike tour from there. Tomorrow we will hit the highway, the next destination in sight is Rancho Sol y Mar. It is a sustainable, off the grid ranch that we are interested in checking out! I Love your life too, Bradie 🙂 This is just better than I could have imagined for you boys, you are all truley blessed. Take care and thanks for the updates. NO SEE ‘EMS are mean! It truly must have been great getting your little taste of home. You all be safe and keep on writing. We REALLY enjoy your blogs! What a fantastic journey. I can’t wait to hear what happens next!